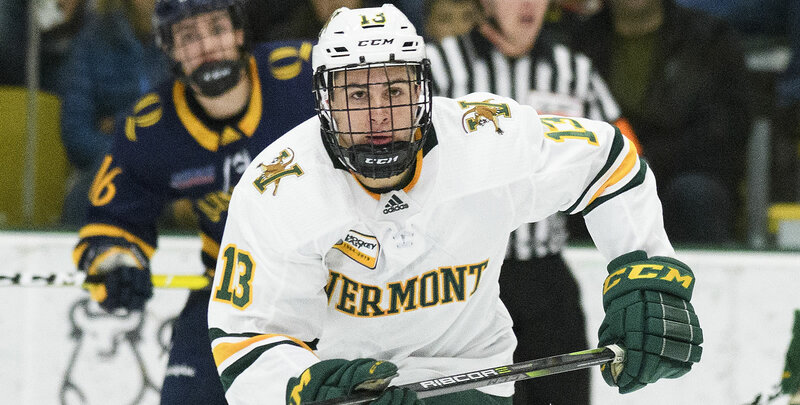 PROVIDENCE, R.I. - An exchange of third period goals resulted in a 1-1 tie between the University of Vermont and the No. 9 Providence College men's hockey team on Saturday night at Schneider Arena. - Providence outshot the Catamounts, 14-5, in a scoreless first period. Neither side could capitalize on their lone power plays. - At first glance it looked like the Friars took a one-goal advantage with 6:35 to play in the middle stanza. Brandon Duhaime re-directed a wrist shot in front of the net with a man advantage, but after the review the officials called off the goal due to Providence being offsides on the zone entry. - Hayden Hawkey matched Stefanos Lekkas' success in net through the first two periods. Hawkey tallied 12 saves compared to Lekkas' 30 and neither team was able to get one past them. - Providence gained the lead courtesy of Vincent Desharnais just 56 seconds into the third period. Desharnais put a wrist-shot on net from the right point that snuck in over Lekkas' stick side, due to traffic in front of the net. Brandon Duhaime was credited with the assist. - Desharnais' goal marked his fourth of the season and third-consecutive game with a goal. - The Catamounts netted the equalizer with nine minutes to play in the third period. Max Kaufman delivered a cross-ice pass in front of the crease that Cipollone one-timed home over Hawkey's glove. Corey Moriarty was credited for the secondary assist on the play. - Providence recorded three shots in the five-minute overtime period compared to Vermont's zero. The best chance came on Josh Wilkins' net drive and Jay O'Brien's follow-up that Lekkas got a piece of to deny the Friars the game-winner. - The Friars now sit at 5-3-3 on their home ice this season and 8-6-2 in the Hockey East. - Providence's winless streak against Vermont was extended to four games (0-2-2). 1-0 (PC) - 0:56/3rd - EV - Vincent Desharnais (Duhaime) - Wrist shot from the top of the right circle through traffic and off the post. 1-1 (UVM) - 11:10/3rd - EV - Joey Cipollone (Kaufman, Moriarty) - one-timer off a cross ice pass in front of the crease. The Friars will travel to Orono, Maine to match up with the University of Maine at Alfond Arena on Friday, Feb. 8 at 7:00 p.m to kick-off a two-game series.